I know you’ve been very helpful answering questions of other posters, so was wondering if you could help me as well. 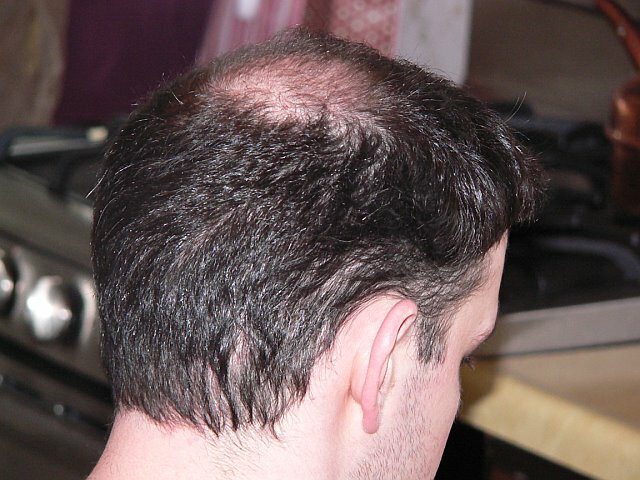 In terms of the hair you had transplanted in your hairline - Did you get pimples in the hairline after the procedure? If so, how long did they last and did you use anything to get rid of them? I have been told that sweating increasing the pimples. Also, how long did it take for your donor site to recover? Initially did it look like your donor site was overtaxed? I guess you had a strip, but I am talking about FUE. Nevertheless, in your experience with other patients how long has it taken for the donor site to fully recover? I had 3400 from a strip and then recently 3100 from a FUE. Does that sound like too much has been taken out from the FUE? Thanks in advance for your help. Really appreciate it. This is Eric from Alvi Armani. I am happy you chose our clinic for your procedure. You have mentioned applying Toppik and Dermacth to the recipient area to conceal; this is not advisable as it can effect growth. I need to stress that you need to continue to follow the post op instructions exactly. Speaking from experience your donor hair will thicken out in the next month or so. I have had both strip and FUE with DR. Armani. You just had your procedure AK, give it some time. It’s very common to analyze how things look now, but you are no where close to the final look in the area grafted or in the donor area. I know a month feels like a long time but in the hair transplant world it really is not. You have just started the proccess. Your donor will thicken, the redness will go away and before you know it you will be enjoying your new hair. For any questions regarding what you can and cannot apply to your grafts you should contact the clinic or your consultant directly. Here is my donor 2 months after my FUE procedure. Everythingt thickened up great. I appreciate you thinking of me with regards to your questions however I must defer to Pats205 and the information he has given you. It is always best to confer with your own clinic that performed your surgery for post-op questions. However, regarding my own experience, I did have some pimples in my hairline but only because of new growth with the occasional ingrown hair. 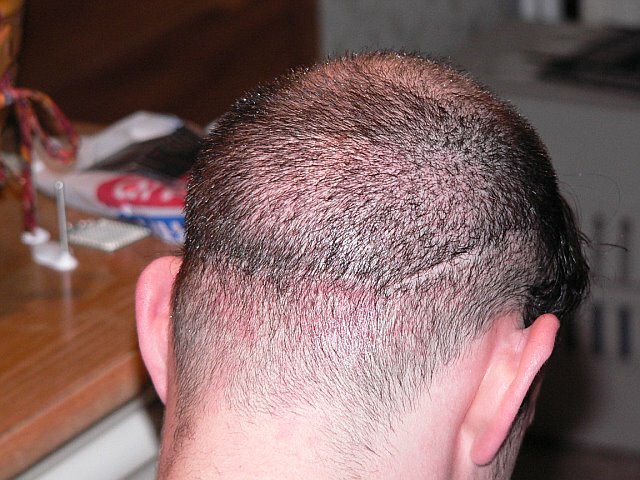 It happened in my hairline as well as other areas where grafts were placed. If you are getting them now I suspect it is from a few early potential sprouts coming in (assuming you are one month post-op). If you are using too much Toppik or any concealers however then they could be clogging your pores causing infection. I recommend you immediately call the Armani clinic and speak to your consultant and/or Dr. Armani himself. Do not wait for email. If you are local to his office you may need him to write a prescription for an antibiotic or he may recommend that your local doctor do so if you are not local to the Armani clinic. It would also be a good idea to send along some photos for evaluation of your current situation. Overall, I’m sure you’re fine but it is always a good idea to err on the side of caution. Yes, I have been very anxious since I would have expected better 5 weeks after the surgery. Speaking with Dr Armani has helped ease that. I will not apply anything to the receipient site. Thanks for the advice and words. One question is about the bumps, especially on the sides of my hairline. Will these go away? I am actually not experiencing that many pimples. It is more small bumps. When can I expect these to diminish? Also at the 2 month mark along with better growth in my donor site? Thanks for the advice Jo. Appreciate it. Yes, I have been in touch with the Dr Armani. My anxiousness plus self consciouness was getting the better of me. I really do need to give myself more time, it’s just that I don’t have much time left before having to go back to work. I am actually only getting a couple of pimples. I am more concerned about small bumps in my hairline, especially around the corners of the hairline where there isn’t any hair and the hairline had been brought down slightly. In the actual hairline the native hair seem to conceal them. » Thanks for the advice Jo. Appreciate it. » where there isn’t any hair and the hairline had been brought down slightly. » In the actual hairline the native hair seem to conceal them. Speaking in general terms any bumps that may be visible now most likely will settle down with time. It is common to be a bit nervous a month after your procedure. I understand The best advice I can give you is to relax, do some things to take your mind off of your hair for a bit, a hobby perhaps. Let the hair and result grow out and trust the clinic you chose for your procedure. Dr. Armani has been personally answering your questions, please follow his advice. You chose Dr. Armani because you trusted him as your doctor, follow his advice and continue to follow the post op instructions he devised for you. You are going to be very happy with your result, you just need be patient and let the proccess continue. Again, please do not use any Dermatch or Toppik over the newly transplanted grafts. This can effect growth and we do not want that. Yes, I won’t be using any since I know it could compromise the growth. In regards to the small bumps in the hairline, will these settle down? » Yes, I won’t be using any since I know it could compromise the growth. » In regards to the small bumps in the hairline, will these settle down? What did Dr. Armani say? I believe he answered this question for you correct? Not quite, he talked to me about the pimples. I have also been confusing the pimples for small bumps. My pimples are few and far inbetween. They hurt a little, grow out, and retreat. That’s fine. The little bumps are the ones I am more worried about, especially around the sides of the hairline. I will email the Dr and ask now. Pats, did you experience these yoursel as well? The small bumps in the hairline?